A description of many Volga German colonies was made by the Saratov Office for the Guardianship of Foreign Settlers, referred to by the colonists as the Kontora, as part of the 1798 Russian Census. The report for Norka was written and signed by Collegiate Assessor and Cavalier Sixtel on November 26, 1798 and was based on personal observation as well as information from the Vorsteher (leader of the village council) and Beisitzer (village council assessor) of Norka. The following English translation from a copy of the original 1798 report by Collegiate Assessor and Cavalier Sixtel and the accompanying notes are courtesy of Vera Beljakova-Miller. 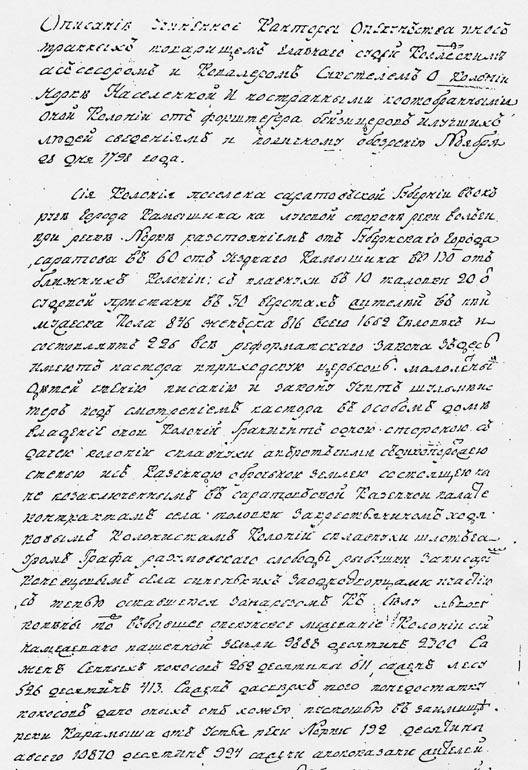 A page of the original 1798 census description written in Cyrillic script. Description made for the Kontora (Office) of Immigrant Oversight by Fellow of the Chief Justice, Collegiate Assessor and Cavalier Sixtel, of the colony of Norka (also known as Weigandt), inhabited by foreigners, according to information from the Vorsteher (village mayor), Beisitzer (assessor), and best people, also by personal observation. November 28, 1798. This colony is located in the Saratov gubernia, in the district of the city of Kamyshin, on the hilly side of the Volga River, along the river Norka. It is 60 versts distant from the gubernia city of Saratov, 130 versts from Kamyshin. Distances to neighboring colonies are: Splavnukha (colony of Huck) - 10 versts, Talovka (colony of Beideck) - 20 versts. It is 30 versts to the boat landing. There are in the colony 846 male inhabitants, and 816 females, totaling 1,662 persons comprising 226 families. All are of the Reformed faith. They have here their own pastor and parish church. Small children are taught reading, writing, and religion by a schoolmaster in a specially constructed school building. The properties of the colony are bordered on one side by lands belonging to the colony of Splavnukha and on the other sides by wild steppe and by state-owned rental lands consisting now of those under contract between the Saratov Treasury Chamber with the village of Talovka, with peasant Khodyakov, with colonist Schlotthauer of Splavnukha, with Count Razumovsky's settlement of Ryubushka, with scribe Konevtsov's village of Sinenky, with odnodvortsy (members of a special group of smallholders of 18th century Russia, descendants of the lowest category of the service class), and by steppe left over from the allocation to the village of Lvov and land vacated by the Office of Immigrant Oversight. This colony was allocated arable farm land of 9,888 desyatina 2,300 sazhen, hay lands of 262 desyatina 611 sazhen, forest of 526 desyatina 413 sazhen. In addition, because of insufficient hay lands, they were allocated wastelands totaling 192 desyatina in the plot along the Karamysh River, near the mouth of the Norka River. The land allotment totals 10,870 desyatina 924 sazhen. According to the inhabitants, 110 desyatina are taken by farmsteads, 70 by roads. Only 1,000 desyatina are suitable for farming, the remainder being too sandy, rocky, and saline to produce any kind of crops. Therefore, they produce grain on the previously mentioned rental lands owned by colonist Schlotthauer and by peasant Khodyakov. They pay the rent out of their own pockets. They especially use steppe lands allocated to the village of Lvov. They cultivate some 3,000 desyatina. Because there is insufficient suitable land for pasturing livestock in their own allotment, they drive the stock to the above mentioned wild steppe. Within their allocation of hay lands, there are actually no more than 100 desyatina, and an equal amount in the abandoned wastelands. The forest lands allocated to them had already been utilized upon settlement and in succeeding years as needed. There remain now only 300 desyatina. This forest consists of oak, birch, aspen, linden, and fir, good only for firewood. They cut about one-third of it for firewood and other necessities. The remainder is in reserve. The colony lacks sufficient arable farm land and hay lands. These can in part be increased by allocation from plots of land adjoining their rented lands and from the wild steppe, on which the colonists currently pasture their livestock. Hay lands can be allocated from wet meadows along the banks of the Karamysh River which flows into the Razhek in the quit-rent lands of the community of Rybushka, belonging to scribe Konevtsov. But for the most part of the local inhabitants, neither land nor hay lands can be completely satisfactory because, just as is the case with the colony of Splavnukha, there is a shortage of quit-rent land. For both colonies the land will be insufficient. Above all, this colony has a shortage of water because they use a spring which flows past their huts. The river Norka is no more than a verst distant. There are also shortages of flax and hemp (Konoplia), which do not grow here. All the inhabitants are engaged in farming. There are tradesmen: three blacksmiths, four shoemakers. The colonists are favorably disposed toward work. A few live in good conditions, most in mediocre conditions. Buildings are constructed of wood. Except for 26 new ones, homes are dilapidated but have been repaired. Six homes are of stone. There are no adobe buildings. There is no source of stone for building in the colony, but they quarry it from state-owned land 10 versts from the colony, where there is only a small amount. Yards are separated from the streets by fences, and on the inside are divided by wattle fences. There are gardens behind the farmyards. There are two flour mills on the Norka River. They have no orchards or apiaries. The closest fields are immediate to the colony, and the furthest field is 5 versts distant. The rented fields are some 10 and 15 versts distant. Farmlands are divided into three fields. They till with plows. They do not fertilize the land. Harvests of grain in several places are good, but only mediocre in most places. They harvest and thresh the grain on threshing floors immediate to the yards, where they store the grain and hay. In order to prevent the danger of fire, all the inhabitants have been cautioned to move the threshing floors and areas for drying grain to a distance from the colony. They sell the grain in the city of Saratov. Prices vary. In the summer and winter of 1797, they sold rye for 2 rubles, wheat for 3 rubles 30 kopeks, barley for 1 ruble 20 kopeks, oats for 1 ruble 10 kopeks, millet for 1 ruble 20 kopeks per chetvert. The common granary is in good order and constructed in a suitable place. Rye, wheat, and oats are stored therein by chetvert per family personally. There are 15 of the first, 40 of the second, and 50 chetvert of the third held for allocation to the local inhabitants. Completed with signatures of the Vorsteher, Beisitzer, and best people of the colony. Authenticated by Collegiate Assessor and Cavalier Sixtel. A Collegial Assessor is a Russian Civil Service ranking and equates roughly with Captain in the Artillery/Engineers; Rotmister/Reitmeister in the Cavalry and Guards Cavalry; Staff-Captain in the Guards Infantry or Senior Lieutenant in the Navy. The 1798 census includes a register of 100 colonists that moved to other colonies since the 1775 census. Many of these colonists were widows or single women who married and resettled in other colonies. The register is dated November 26, 1798. Mai, Brent Alan. 1798 Census of the German Colonies along the Volga: Economy, Population, and Agriculture. Lincoln, Neb. : American Historical Society of Germans from Russia, 1999. pgs. 169-171, Print. Translated from Russian to English by Rick Rye. Last updated May 4, 2016.